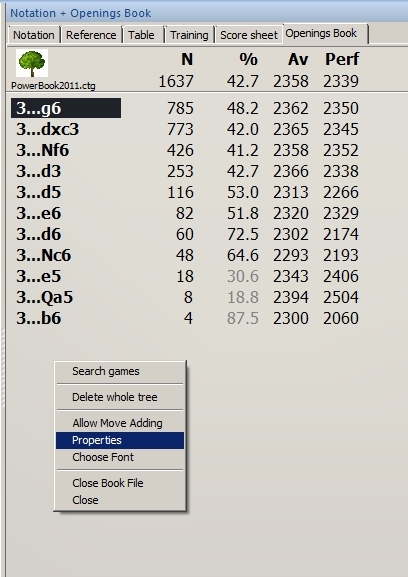 Viewing opening books (also known as opening trees) such as Powerbook 2011 using ChessBase 11 can provide valuable information when you’re researching openings; you can bang through a series of moves and see statistics on how well (or poorly) specific moves and variations have fared in practical play. 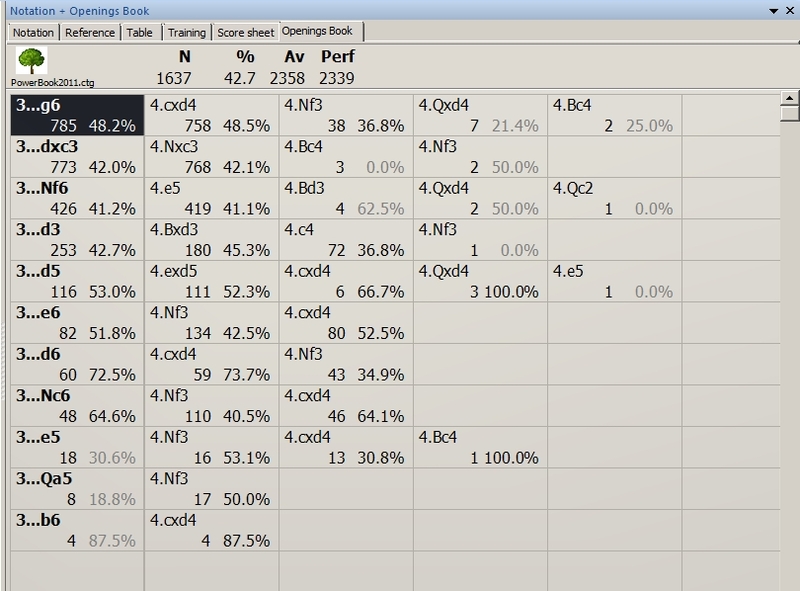 All of Black’s moves from the games contained in the Powerbook tree are displayed, along with the number of games in which each was played, the moves’ success rates, the average Elo ratings of the players who played the moves, and the subsequent performance rating. Note that I have my opening book set to display success percentages from White’s perspective, so that a lower percentage means that a particular move was good for Black. You’ll recall, though, that I’m researching this opening from White’s perspective. While I’m certainly interested in seeing Black’s moves in the current position, it would also be great to get an overview of White’s responses to each of Black’s potential replies (and success rates for each) without having to keep moving back and forth between separate displays. 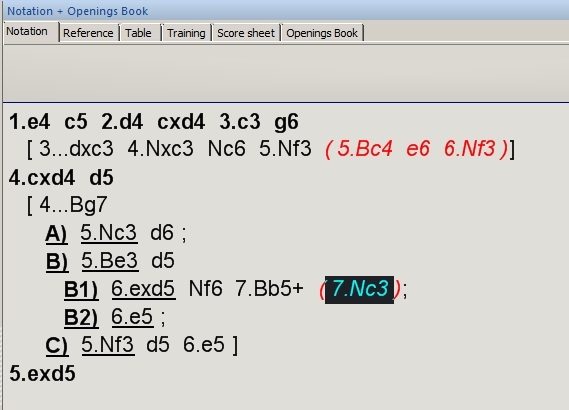 As it turns out, I can do that in ChessBase 11 using the “extended book display”. 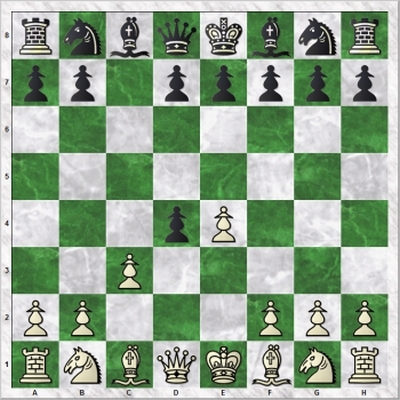 This display will show all of Black’s moves in the current position, as well as White’s responses to those moves, in a tablular (rather than list) format. This provides a number of options for various types of information presented in the book display, as well as changing the way the display itself appears. In this new table display, we can see each of Black’s moves as well as the White replies to those moves, providing us with a nice statistical overview. The left-hand column displays Black’s moves (in bold type) along with the number of games and success percentage for each (just as we saw in the previous “list” display). But in a series of boxes to the right of each of Black’s moves, we see White’s replies listed from left to right. The White reply played most often appears first (in the box immediately to the right of a Black move), followed by the next most often played, and so on down the list moving from left to right. For example, in the illustration above we see that the Black move most often seen in the position after 1.e4 c5 2.d4 cxd4 3.c3 is 3…g6, which was played in 785 games. Looking in the table to the right of this box, we see that White’s replies are 4.cxd4, 4.Nf3, 4.Qxd4, and 4.Bc4; these are listed by their frequency from left to right. Thus 4.cxd4 was the move White played most often (in 758 games), followed by 4.Nf3 (in just 38 games), and the other two moves were made less frequently. Note that 3…g6 was played in 785 games, while the positions after White’s replies combined total more than 785 games (they add up to 805 games, in fact). How can this be? It’s because of move transpositions: in twenty games, the position after White’s fourth move was reached by a different move order. Also notice that some of the success percentages are in half-tone (“greyed out”) in this table format; in the above illustration the percentages for Black’s bottom three moves (3…e5, 3…Qa5, 3…b6) appear in this way, as do a smattering of White’s replies. A percentage in half-tone indicates that they’re aren’t enough games containing that position for a valid statistical sampling. Now that 3…g6 has been played, we see White’s fourth move responses are listed vertically in the left-hand column with Black’s replies listed horizontally beside each of them. Later, if you decide to go back to the regular list view (instead of the table format), just right-click in any empty box of the table, select “Properties” from the pop-up menu, and then uncheck “Show next move” before clicking the “OK” button. ChessBase 11’s tabular extended book display is a really handy tool for “peeking ahead” an extra move in Powerbook 2011, or any other opening book you’re using, and switching back and forth between the displays is as easy as right-clicking and changing one simple setting.